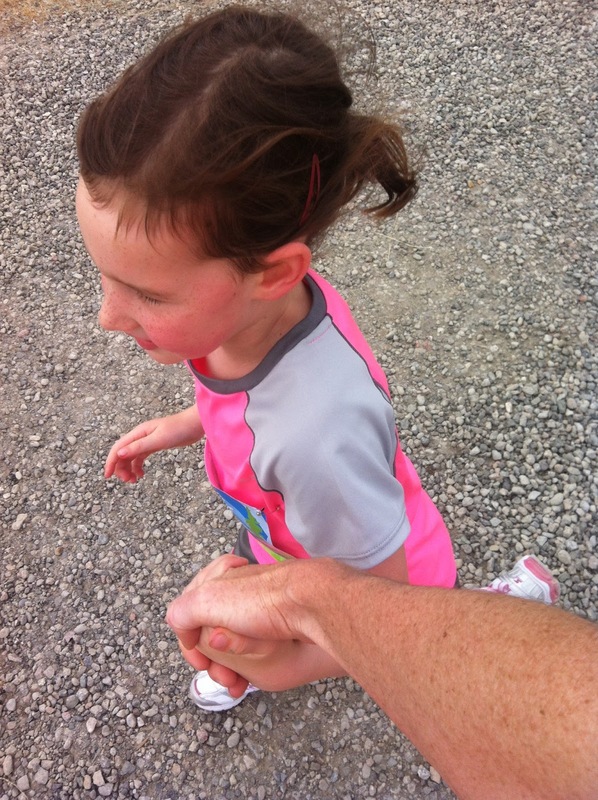 This morning I ran a 5K race with my 4-yo daughter. With the exception of a few short piggyback rides and one even shorter stroller session, she ran the entire thing - her little legs and heart pumping, her eyes bright, and her smile even brighter. It was a fantastic experience, and from the enthusiasm expressed by all members of the family, likely to be the first of many such family races. 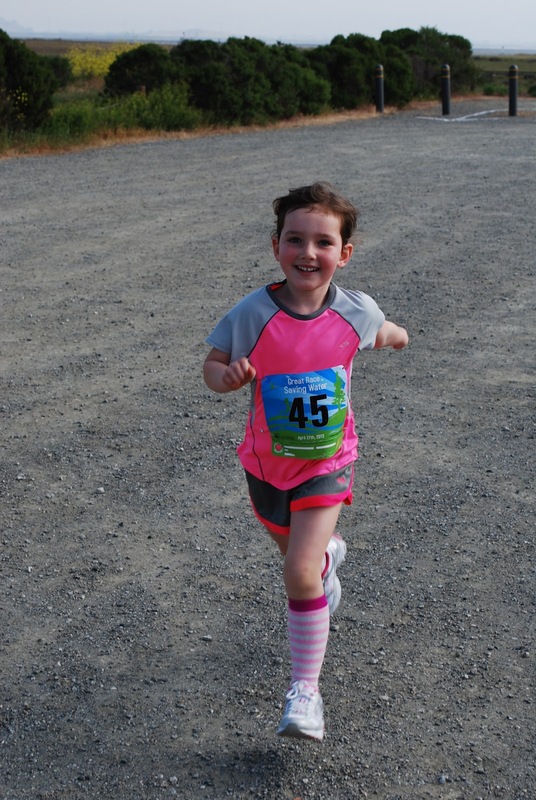 The idea of doing a race with my daughter started almost exactly one year ago when, after seeing me finish a half-marathon, she donned my finisher's medal and expressed a strong interest in running a race herself. 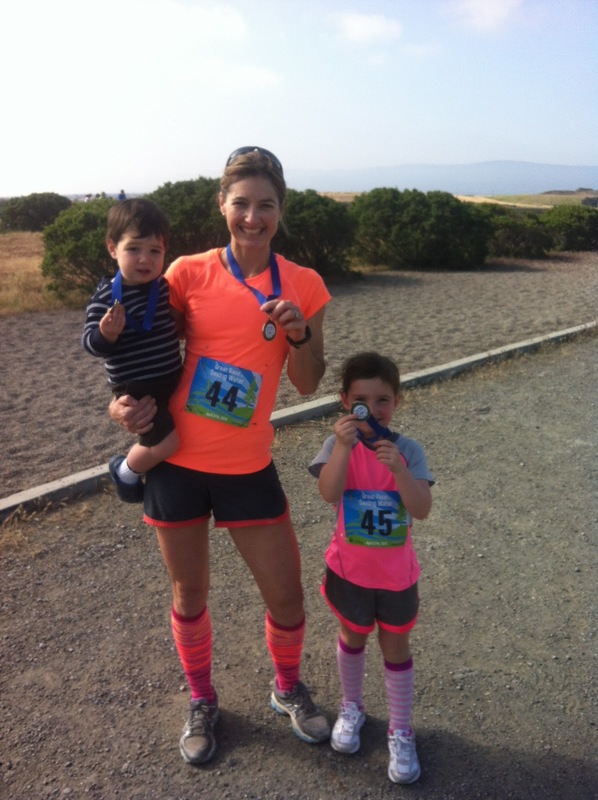 She has always been a great stroller running partner and I was thrilled that she had obviously internalized running as a fun and healthy thing to do. It just so happened that two colleagues that I work closely with on various initiatives had partnered through their respective organizations to organize a 5K Run/Walk to raise awareness about the importance of water conservation, which is extremely important to me, both personally and professionally. 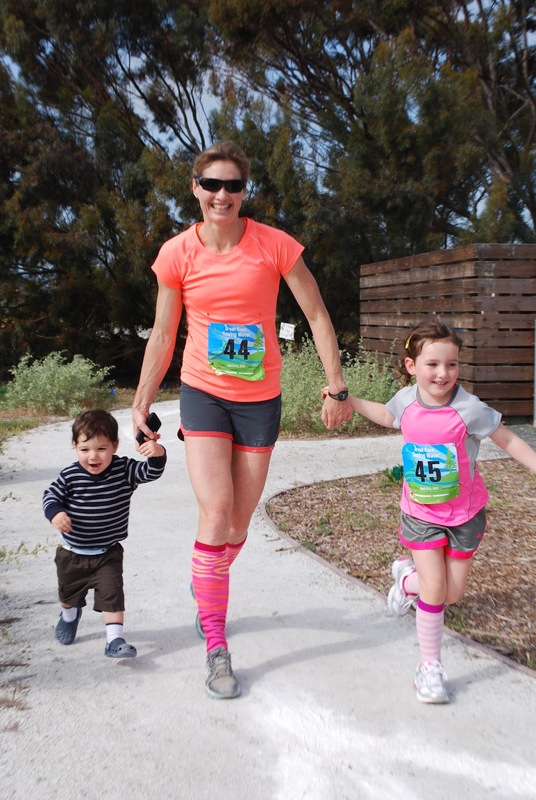 My employer signed up to be a sponsor for The Great Race for Saving Water, and I figured that this local, low-key race would be a great one to do with my family. Sadly, my husband declined to do the race with us (a decision he admittedly now regrets when he saw how much fun we had), but he and my son did agree to come along as the support crew. 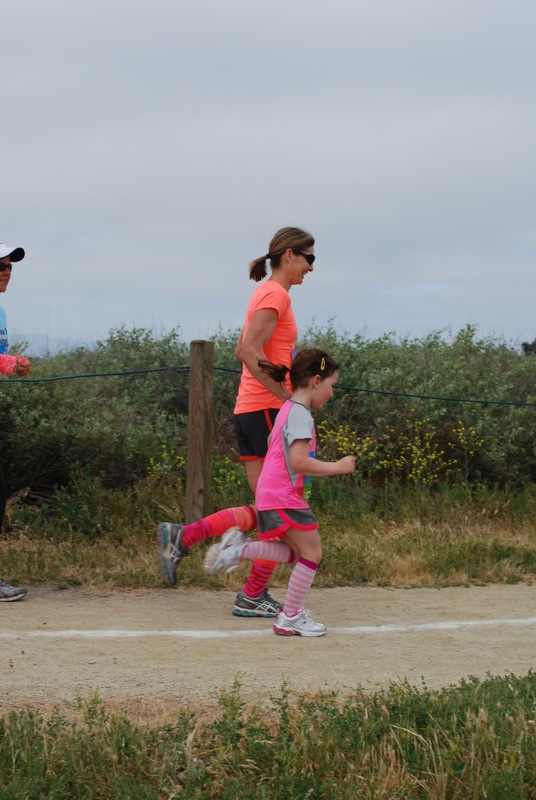 In the week leading up to the race my daughter and I talked about the race often. 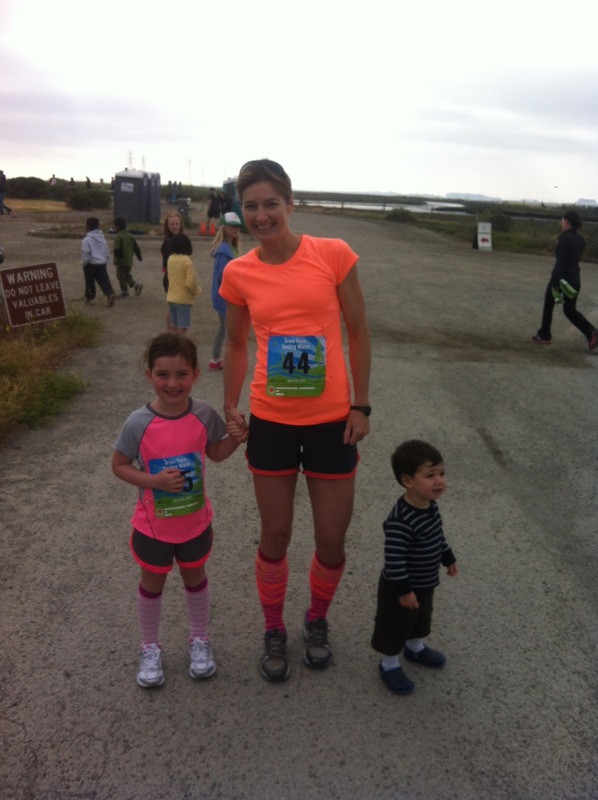 We even did a practice run together one morning as part of my runmute. The night before the race she slept with her racing outfit laid out on the floor next to her bed. Before she even left her room this morning she got herself fully dressed, including tying the laces of her new pink and white running shoes. In usual fashion we arrived at the race with only a few minutes to spare. We quickly got our swag bags (small races give you the best stuff! ), pinned on our race bibs and trotted to the start line, along with about 250 other runners of all shapes, sizes and ages. My daughter was jumping up and down and flapping her little wings, as she does when excited. She helped do the countdown: 3-2-1 and we were off! The race wound through a small portion of one of the open space preserves that line the western edge of the San Francisco Bay. Musicians dotted the course, as did water facts and tips about water conservation. We held hands almost the entire time, and spent much of the race talking about the water cycle and why water conservation is so important. We enjoyed spotting ladybugs and watching all the various birds, from circling seagulls, to a mother duck and eight ducklings. We took our time at the water stations. The few spectators and the many fellow runners cheered for us, and we returned the favor. 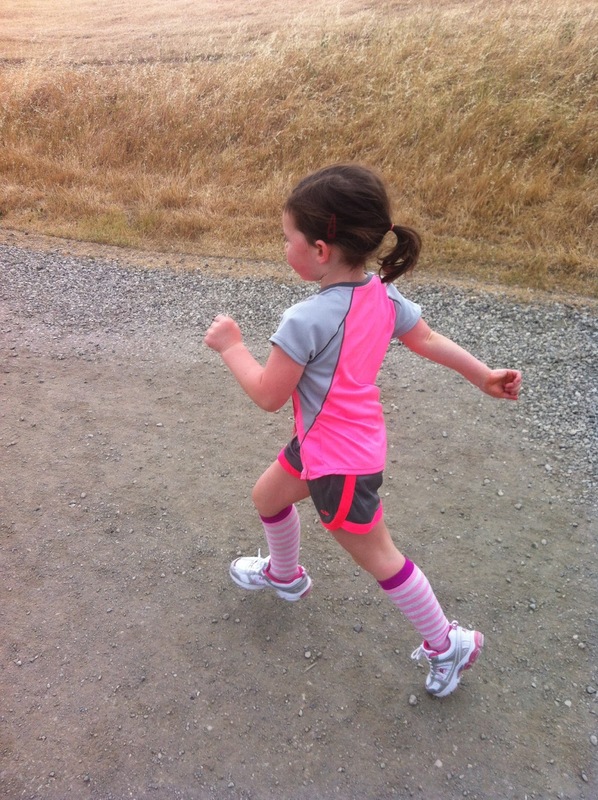 Several times, feeling inspired, my daughter dropped my hand, lengthened her stride and ran independently, powerful and confident in her own body. Other times, fatigued, she accepted short piggyback rides from me. Together we made it all 3.1 miles in less than 45 minutes. My husband and son found us at multiple locations along the course to take photos and cheer for us. With one exception, my daughter declined all invitations to ride in the stroller. 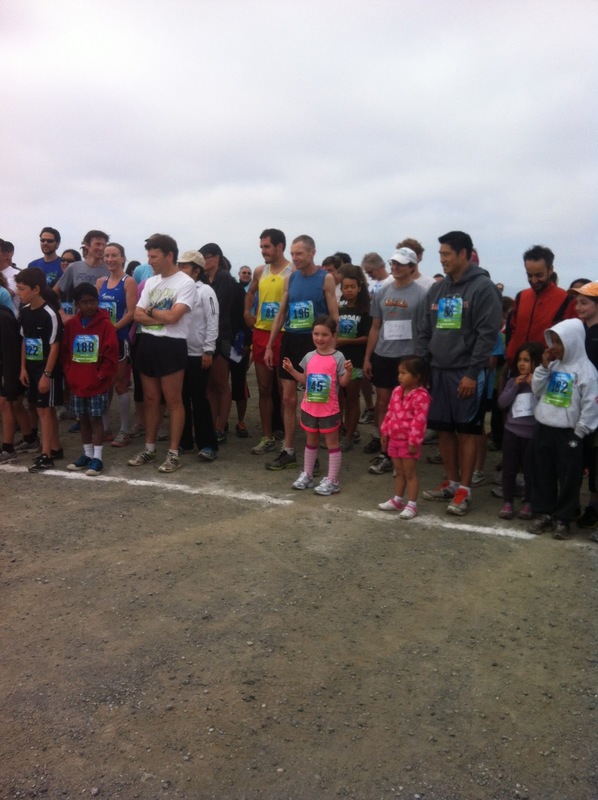 Enamored with the whole experience, and wanting to be a part of things, my son joined us for portions of the run. Most critically he joined us for the final dash (by dash I mean a slow run/walk where he stopped often to pick up rocks of various sizes from the trail) across the finish line and earned himself a finisher's medal, which he wore proudly. All in all, it was a great experience, driven by the fact that this was something that my daughter had really wanted to do. She glowed with pride afterwards, and enjoyed all the little treasures she pulled out of the swag bag. Tonight she plans to sleep in the race shirt she earned. I really hadn't expected her to run the whole way, and had organized a contingency plan in the event that she got tired (i.e., intercept the stroller at various locations), but am so proud of her that she pushed through until the end. Something extra fun (costumes, festival) - today the kids could "catch the running toilet"